William T. Sherman was key to the Union’s victory in the Civil War. William T. Sherman was born on February 8, 1820 in Lancaster, Ohio. William T. Sherman was one of eleven children of Ohio Supreme Court Justice Charles Robert Sherman and Mary Hoyt Sherman. William T. Sherman’s father died unexpectedly in 1829, when Sherman was nine years old. After his father’s death in 1829, William T. Sherman was raised by Lancaster resident Thomas Ewing, who was a prominent lawyer and Ohio politician. William T. Sherman entered the United States Military Academy in 1836 and graduated sixth in his class in 1840. William T. Sherman entered the United States Army as a second lieutenant in the Third Artillery on July 1, 1840. William T. Sherman served in the Second Seminole War in Florida (1835 – 1842). William T. Sherman was stationed in California during the Mexican-American War (1846 – 1848). William T. Sherman married Eleanor “;Ellen”; Boyle Ewing, the daughter of Thomas Ewing, on May 1, 1850, in Blair House, Washington, D.C.
William T. Sherman received a brevet promotion to captain on September 27, 1850. William T. Sherman resigned his commission from the army on September 6, 1853. William T. Sherman was a bank manager in San Francisco and briefly in New York, from 1853 through 1858, until his bank failed as a result of the Panic of 1857. William T. Sherman practiced law in Leavenworth, Kansas in 1858. William T. Sherman served as the first superintendent of the Louisiana State Seminary of Learning & Military Academy (later Louisiana State University) from 1859 to 1861. William T. Sherman resigned his position of superintendent of the Louisiana State Seminary of Learning & Military Academy on January 18, 1861, upon hearing that Louisiana was about to secede from the Union. William T. Sherman served as president of the St. Louis Railroad, a streetcar company in St. Louis, Missouri, for a few months before volunteering for military service in the American Civil War. William T. Sherman turned down an offer to serve in the War Department in 1861. William T. Sherman was commissioned as colonel of the 13th U.S. Infantry regiment, effective May 14, 1861. William T. Sherman distinguished himself at the First Battle of Bull Run (July 21, 1861) and on July 23, 1861, President Abraham Lincoln promoted him to brigadier general of volunteers, effective May 17, 1861. William T. Sherman replaced General Robert Anderson as commander of the Department of the Cumberland on October 8, 1861. On November 15, 1861, the Department of the Cumberland was reorganized as the Department of the Ohio, and General Don Carlos Buell replaced William T. Sherman as department commander at Sherman’s request. In November 1861, William T. Sherman was transferred St. Louis serving under Major General Henry Halleck in the Department of the Missouri. In December 1861, William T. Sherman returned home to Lancaster, Ohio to recuperate after Major General Henry Halleck determined Sherman to be unfit for duty due to stress. In mid-December 1861, William T. Sherman returned to active duty with the Department of the Missouri and assigned to rear area positions, providing support for Brigadier General Ulysses S. Grant’s capture of Fort Henry and Fort Donelson in February 1862. William T. Sherman was given command of the 5th Division of Ulysses S. Grant’s Army of West Tennessee on March 1, 1862. William T. Sherman was criticized for dismissing intelligence reports that Confederate forces were in the area of Pittsburg Landing prior to their surprise attack at the Battle of Shiloh (April 6-7, 1862). Despite being surprised by the Confederate attack at the Battle of Shiloh on the morning of April 6, 1862, William T. Sherman distinguished himself by preventing a Union rout and by helping Ulysses S. Grant plan and execute a successful counterattack on April 7. William T. Sherman was promoted to major-general of volunteers on May 1, 1862. William T. Sherman was appointed to command the District of Memphis on July 21, 1862. After his defeat at the Battle of Chickasaw Bluff’s (December 29, 1862) William T. Sherman was reduced to a corps commander serving under Major General John A. McClernand. William T. Sherman played a minor role in the Union’s capture of Vicksburg, Mississippi. After the surrender of Vicksburg to the Union forces under General Grant on July 4, 1863, Sherman was promoted to the rank of brigadier general in the regular army, in addition to his rank as a major general of volunteers. William T. Sherman was assigned to command of Department of the Tennessee October 27, 1863. William T. Sherman’s Army of the Tennessee played a major role in the Battle of Missionary Ridge and the Union breakout from Chattanooga on November 25, 1863. William T. Sherman’s Army of the Tennessee played a major role in the lifting the Siege of Knoxville in December 1863. William T. Sherman succeeded Ulysses S. Grant as commander of the Military Division of the Mississippi, which included all Union armies between the Appalachian Mountains and the Mississippi River, on March 18, 1864. William T. Sherman launched his successful Atlanta Campaign on May 7, 1864. William T. Sherman was promoted to the rank of major general in the regular army on August 12, 1864. William T. Sherman’s forces captured Atlanta, Georgia on September 2, 1864 when Confederate General John B. Hood’s Army of Tennessee evacuated the city. William T. Sherman ordered all civilians to evacuate Atlanta, Georgia on September 7, 1864. 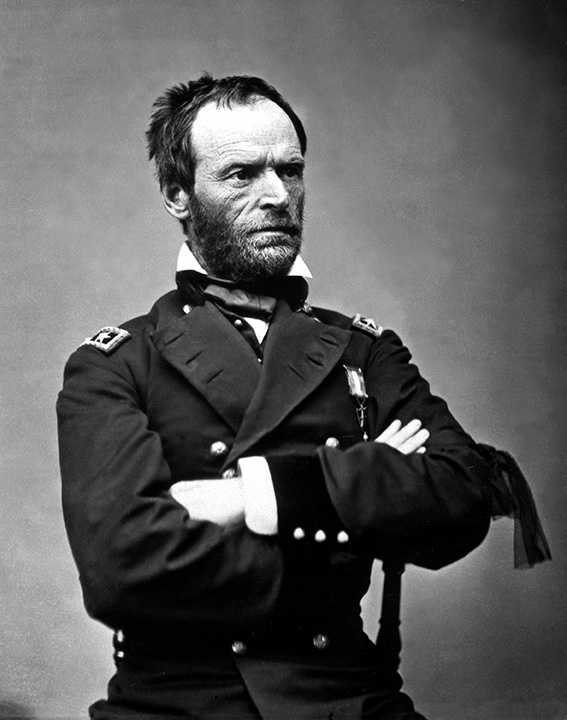 William T. Sherman ordered his army to burn all military and government buildings in Atlanta in November 1864. The resulting fire also destroyed many private residences and shops in the city, creating animosity against Sherman that exist to this day. William T. Sherman began his Savannah Campaign, also known as Sherman’s March to the Sea, on November 15, 1864. Throughout the 300-mile march, 60,000 Union soldiers made Georgia howl by living off the land and practicing a scorched earth campaign. William T. Sherman captured Savannah, Georgia on December 21, 1864. William T. Sherman began his Carolina Campaign in late January 1865. William T. Sherman’s forces captured Columbia, the state capital of South Carolina, on February 17, 1864 and fires that night destroyed most of the central city. The source of the conflagration remains controversial to this day. Some, including Sherman, claimed that Southern soldiers started the blaze by burning bales of cotton as they retreated from the city; some claimed that the fires were deliberate acts of vengeance by Yankee soldiers; while still others claimed that the source was accidental. Whatever the truth, the burning of Columbia has contributed to Sherman’s status in the South as the most detested of Union generals. On April 18, 1865 Confederate General Joseph Johnston surrendered his army and all Confederate forces in the Carolinas, Georgia, and Florida to William T. Sherman. On April 26, Northern leaders forced William T. Sherman to renegotiate General Joseph Johnston’s surrender, because Sherman was not authorized to arrange political terms. William T. Sherman was given command of the Military Division of the Mississippi, which included all land west of the Mississippi River and east of the Rocky Mountains, in June 1865. William T. Sherman was promoted to the rank of lieutenant general in the regular army on July 25, 1866. William T. Sherman was promoted to General of the Army on March 5, 1869. William T. Sherman stepped down as General of the Army on November 1, 1883. William T. Sherman retired from the army on February 8, 1884. William T. Sherman died on February 14, 1891, in New York City. William T. Sherman was buried at Cavalry Cemetery in St. Louis, Missouri.